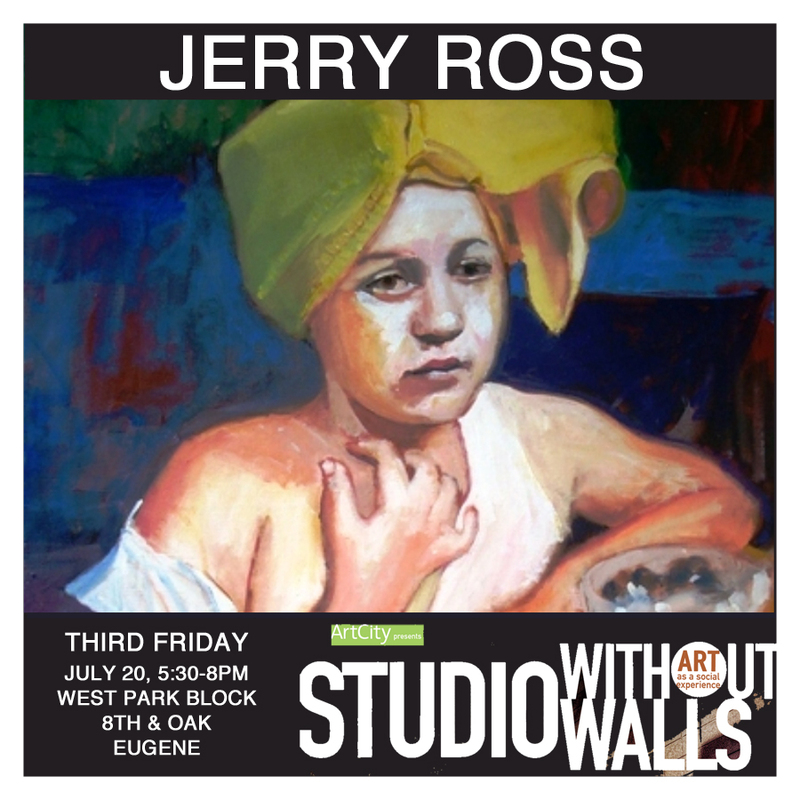 A new art installation by Terry Holloway, will make its debut in Downtown Eugene on Friday, September 21. This piece will be featured at ArtCity’s BEAM, an illuminated outdoor pop-up gallery showcasing multidisciplinary art, from 8:00-11:00 PM at the Park Blocks at the corner of 8th and Oak St. A geometric structure big enough to walk through, the immersive sculpture will be comprised of color and light projected onto external planes, but those who enter will discover flexibility and reflection within. This piece invites the viewer to feel transformed, transported, or immersed in a different world, and then to return to the familiar with a new perspective. Come enjoy this free event, and help achieve ArtCity’s mission “to transform the community through collaborative engagement in the arts”! BEAM 2018 from ArtCity on Vimeo. Harmonic Laboratory presents The Quest: A Multimedia Wayang Kulit, a narrative journey guided by Gamelan Sari Pandhawa, a traditional Indonesian percussion orchestra, and original digital projections by Terry Holloway. 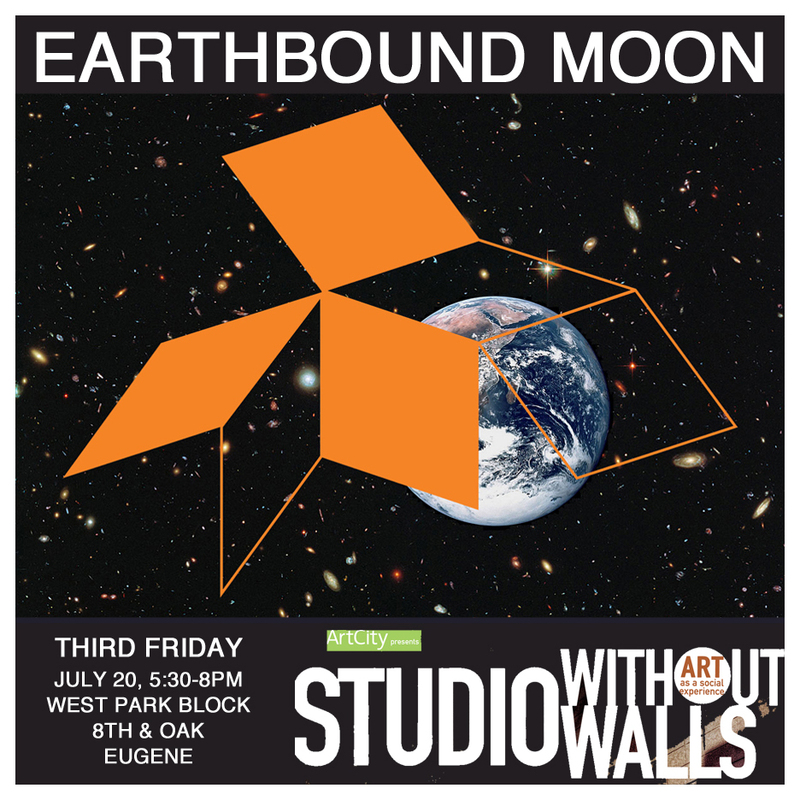 The event will combine gamelan music, abstract video imagery, and Javanese shadow puppetry. 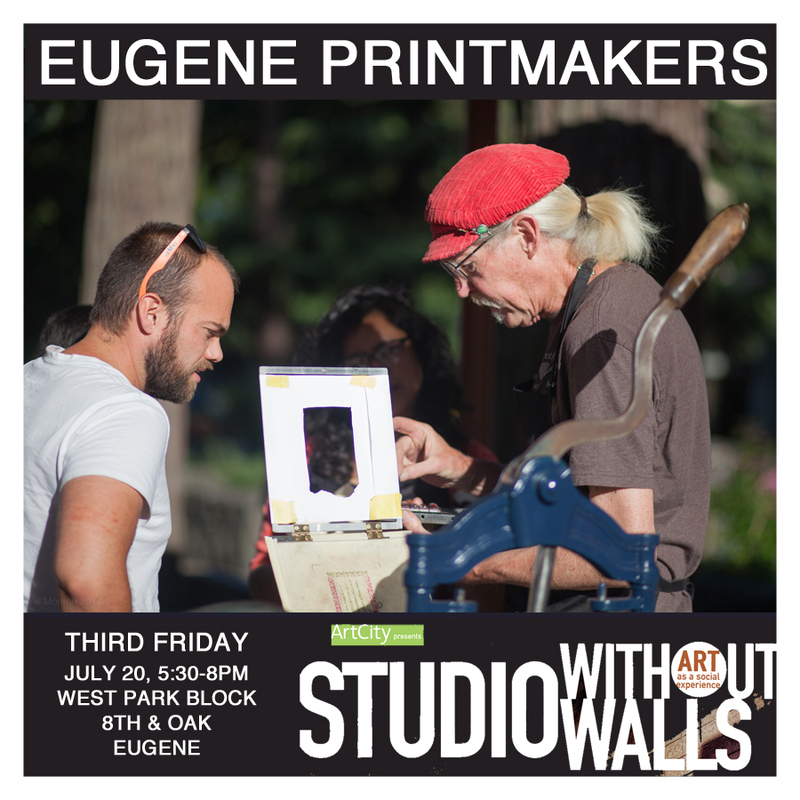 It is part of the Artistic Encounters Series, which aims to bring a sense of unexpected wonder and whimsy to locations throughout downtown Eugene by presenting unique artistic experiences. Gamelan Sari Pandhawa is dedicated to providing an educational and entertaining multi-cultural experience for the Eugene community, enriching lives through expanding cultural awareness. The ensemble was established in 1996 and has performed in concert and taught classes throughout the area. This dedicated group performs on bronze and wood instruments handcrafted and painted in Central Java and seeks to increase the community’s understanding of traditional Javanese cultural arts, music, dance and shadow puppetry. 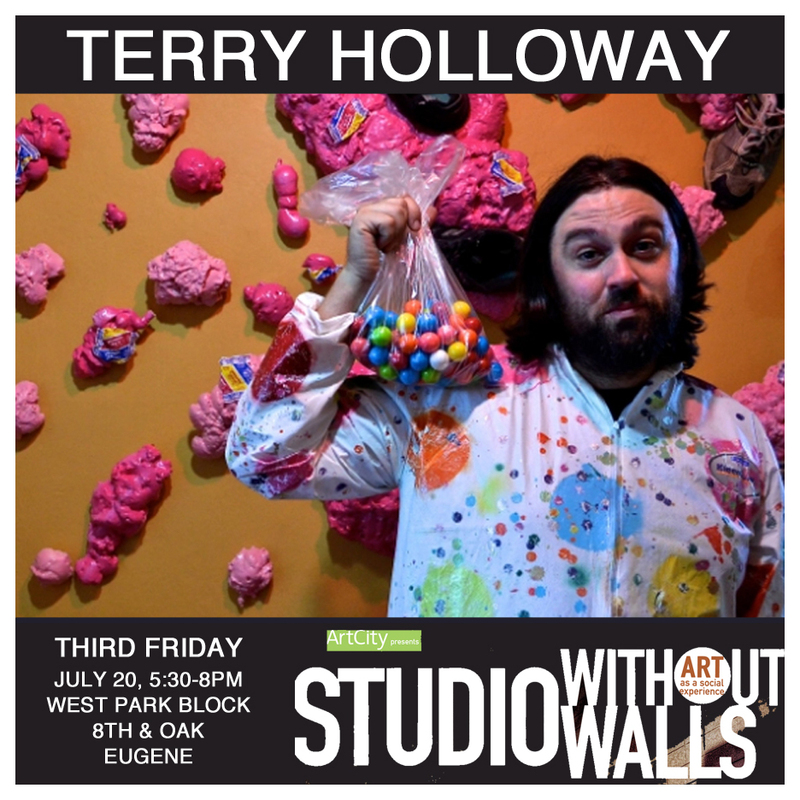 Terry Holloway will be illuminating the puppetry with live video projections consisting of a wide array of colors and generative design. The abstract textures and visuals will be adapted and manipulated live to match the environment and tone of the narrative. 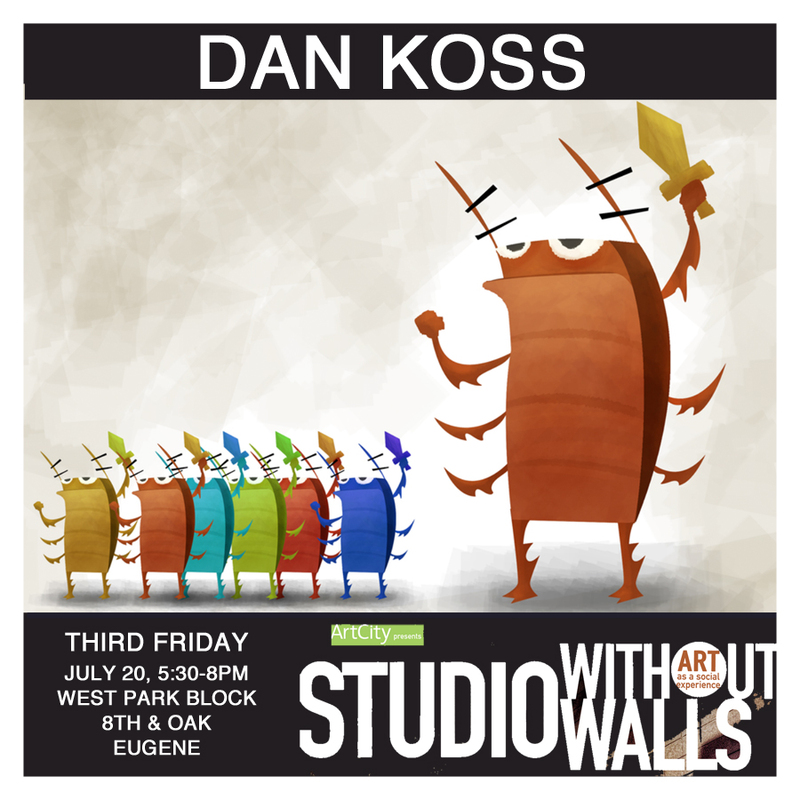 Come enjoy this free show at 9pm on Thursday, August 30th at Kesey Square in Eugene, Oregon. 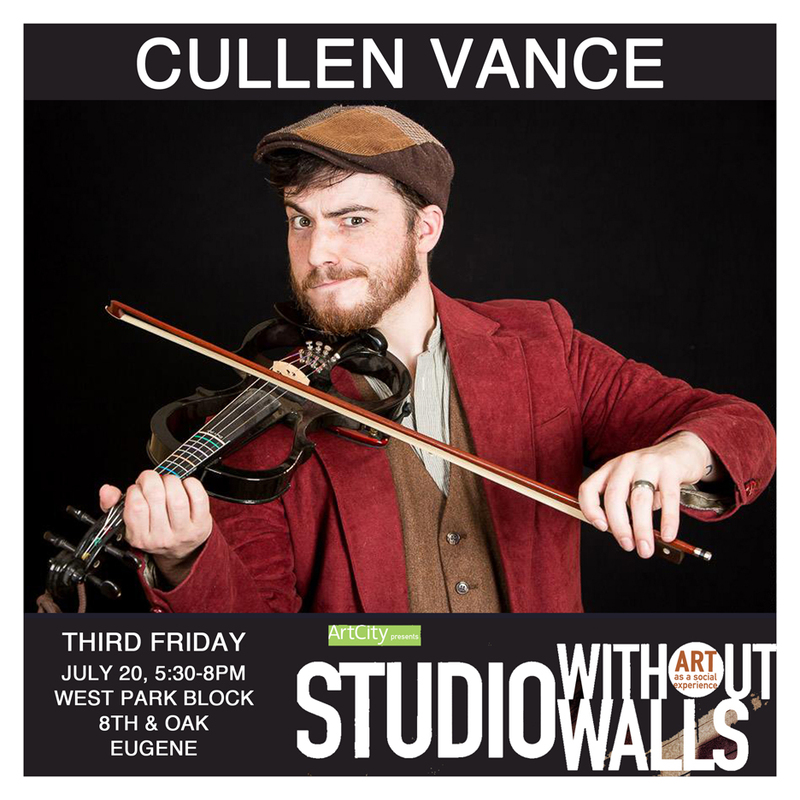 Studio Without Walls is a EUGfun! 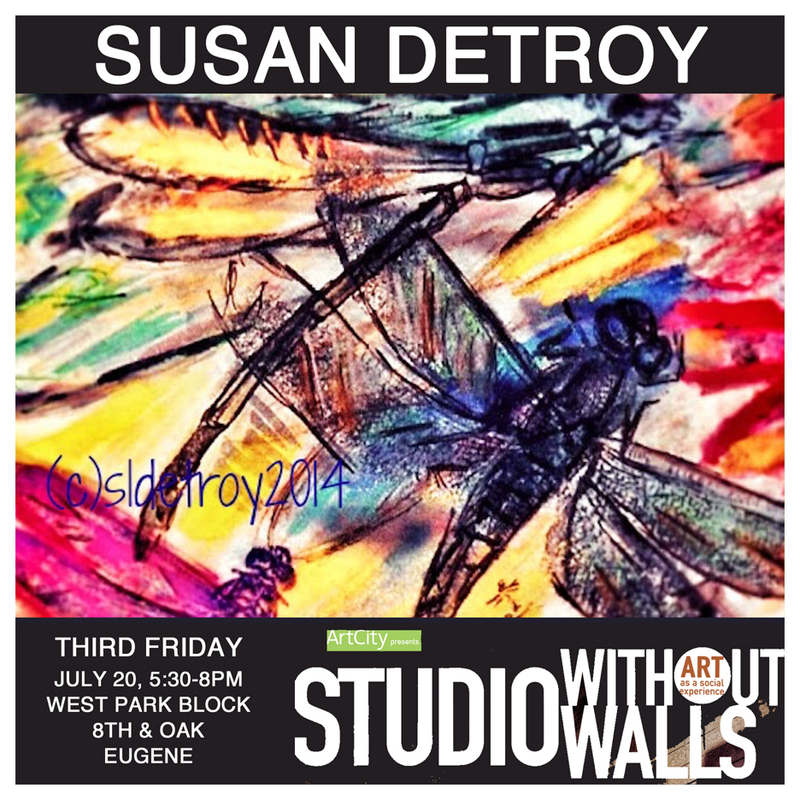 event series that is produced by ArtCity Eugene on the Third Friday of July, August, and September. Enjoy a European-style outdoor studio environment where art-making, food, and beverage are paired with an engaging social experience. Join us for a free art happening where you are invited to engage with artists as they make art. You are also welcome to bring your own materials and make art along-side other artists. 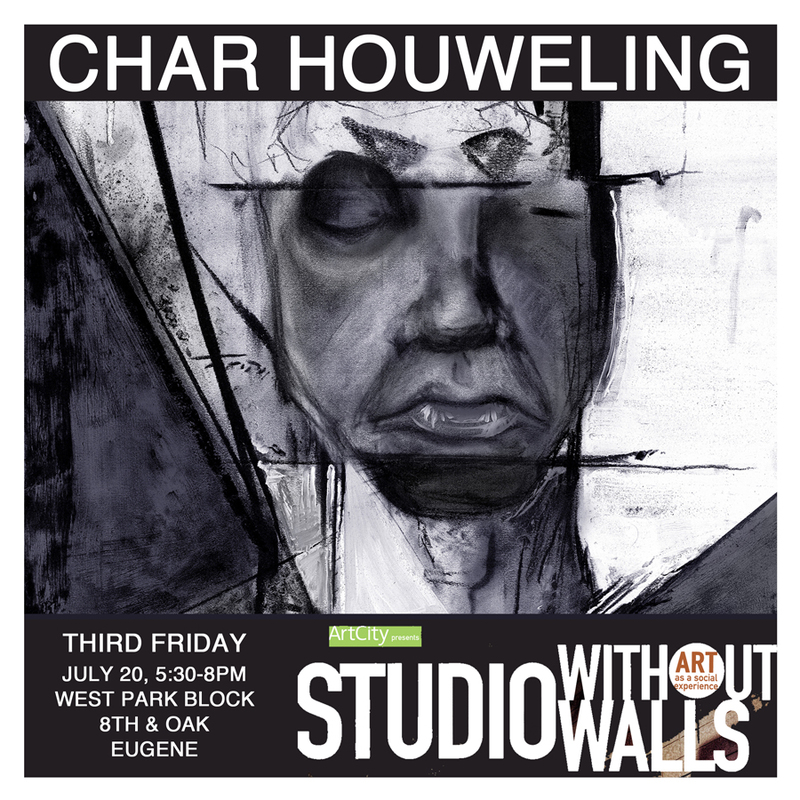 Participating artists are: Char Houweling, Terry Holloway, Dan Koss, Earthbound Moon, Susan Detroy, Cullen Vance, Jerry Ross, Dead Parrots Society, Eugene Printmakers, and Stephanie Jackson. Food & Beverage vendors are PaKa, Coconut Bliss, Wildcraft Cider, and Thinking Tree Spirit. 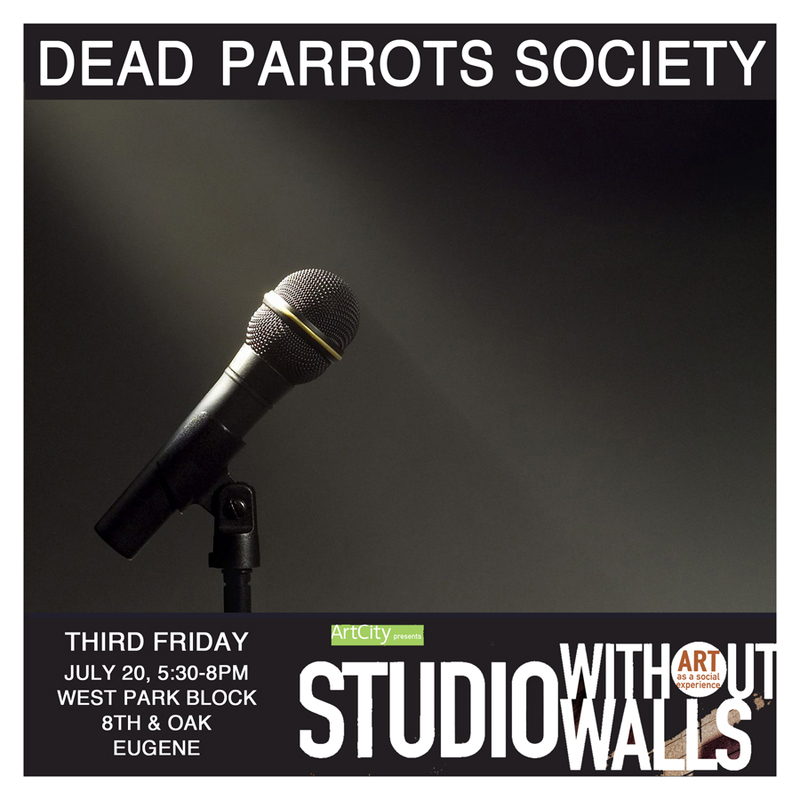 Special thanks go to our event sponsors: City of Eugene Cultural Services, Sugartop Buddery, Pearly Whites of Eugene, Swing-on-Home Real Estate, and Lane Arts Council. The 2-Day Installation on the collaborative piece, Spark, will begin next week out at the Pickathon Music Festival in Happy Valley, Oregon. The support team is comprised of artists Terry Holloway and Cari Ingrassia, with the assistance of Meghan Horne-Brine and Jen Hagerman. The crew will begin early in the morning on Tuesday installing the suspension rig with the goal of hanging all 5 LED lighting grids, as well as installing all 120 custom built LED lights. The day will conclude with an electrical test to access battery efficiency and note any changes to be made the next day. Wednesday is reserved for attaching the “creative” pouches delicately around the LED lights. Workers will also be tasked with making any necessary adjustments that were noticed the night before. Once the pouches are in place, installation continues to the wiring and networking of all sensors and lights. Once everything is wired correctly, batteries will be installed and the whole installation will then be tested throughout the night to ensure all tech is running safely and properly. Stay tuned here for more documentation during the installation process. 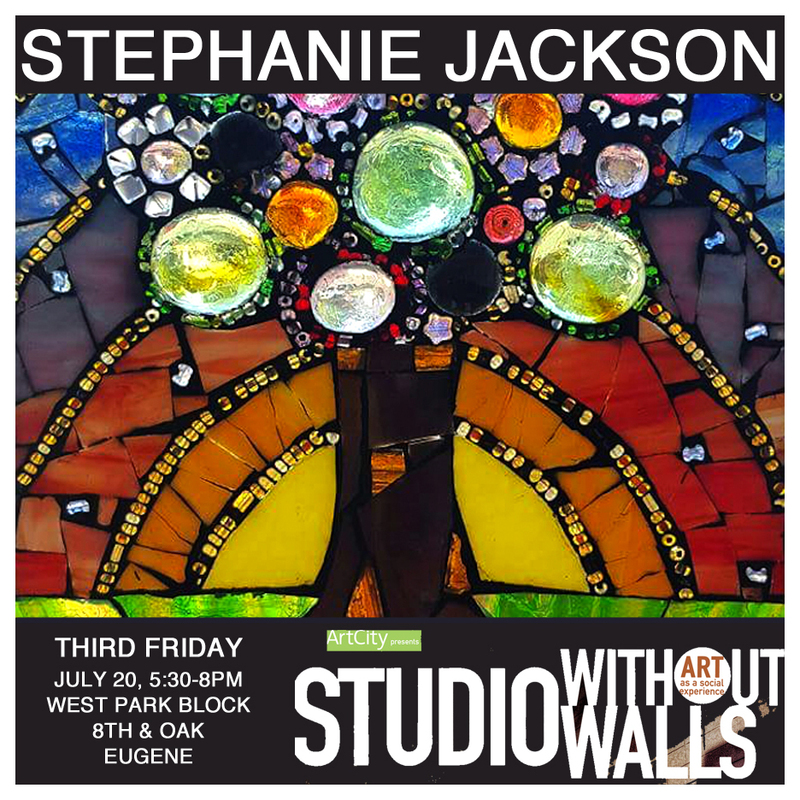 We are happy to announce that Spark, a collaboration by Terry Holloway and Cari Ingrassia, has been invited to be part of the curated art series at the 20th Annual Pickathon Music Festival this year. The Fuzzy Beuys will be performing a surprise VJ set Friday night from 5:30-6:30 downtown at the Park Blocks. Also get your dance on with outstanding live soul, funk and jazz from Sam & the Courtesy Clerks. There will also be vegan street food from Vengan Pa’Ka, delectable dumplings from The Dumpling Group and festive alcoholic beverages from Thinking Tree Distillery. Sam & the Courtesy Clerks entertain you starting at 5:30 p.m, while a variety of PNW visual artists augment the space using state-of-the-art projection mapping techniques. Friday, December 8 • 4:30-6:30 p.m.